A certain amount of sweetness reigns during the month of February. Next to jewelry-store surprises and long-stemmed roses, what could be more special than an expression of love of the edible kind? Cookies, it seems, are a way to reach anyone’s heart — a task easily achieved with Valentine Heart Sandwich Cookies. These cookies are inspired by the famous Linzer torte named after the Austrian town of Linz where the torte originated. In a large mixing bowl, sift together flour, cornstarch and cinnamon. In the bowl of a food processor, pulse almonds until finely ground. Whisk almonds into flour mixture; set aside. In the bowl of an electric mixer fitted with the paddle attachment, beat butter and sugar on medium-high speed until light and fluffy, about 2 to 4 minutes. Add egg, vanilla and lemon zest; beat to combine, scraping down sides of bowl. With mixer on low, add almond-flour mixture; beat just until flour has been incorporated. Turn out dough onto a work surface; divide dough in half and shape each half into flat rounds. Wrap each round in plastic wrap; chill in refrigerator for at least 1 hour. Remove one round of dough from refrigerator and let stand until slightly soft. On a large piece of parchment paper dusted with flour, roll dough out to 1/8-inch thickness. Transfer parchment paper and dough to a baking sheet; refrigerate until firm, about 20 minutes. Repeat with remaining dough. Bake, rotating pans halfway through, until cookies are crisp and lightly golden, about 15 minutes. Transfer cookies to a wire rack to cool completely. Spread a third of the uncut cookies with one flavor of each of the jams. Sift confectioners’ sugar over cutout hearts. 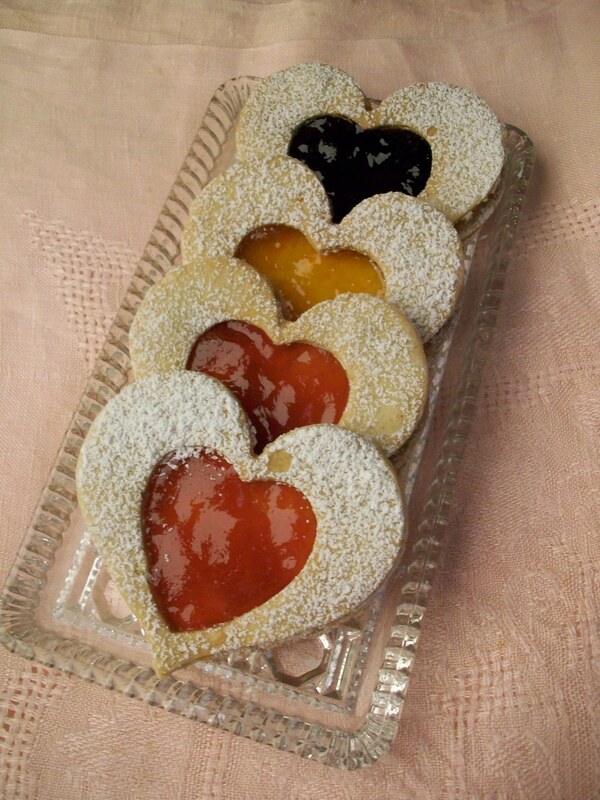 Just before serving, place cookies with cutout middles on top of uncut cookies, so that jam shows through the cutout.